Hardcover, 11 x 9.5 in. / 200 pgs / 108 color 129 bw. Edited by Robert Storr. Essays by Robert Storr, John Keenen and Joan Pachner. Tony Smith is primarily known as a sculptor of large abstract constructions, which he made during the last 20 years of his life. Less well known is the fact that he was also an architect and a painter--a true Renaissance man. In the mid-1930s he studied drawing, painting, and anatomy at the Arts Student League in New York, later moving to Chicago, where he took courses in architecture and design at the New Bauhaus. Subsequent work with Frank Lloyd Wright led him to establish his own architectural firm in the 40s. Becoming disheartened with the role of architect, he returned to painting, and in the late 50s found his ultimate calling in sculpture. This volume provides the first complete overview of the career of this unique figure in the postwar American artistic vanguard. 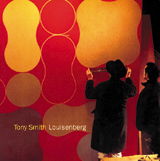 Published in conjunction with a 1998 exhibition at The Museum of Modern Art, New York, this book presents Smith's life and work in all mediums; thoughtful, critical essays; an illustrated chronology; a section of writings, interviews, and letters by Smith, his family, and his friends; and a selected bibliography and exhibition history. FORMAT: Hardcover, 11 x 9.5 in. / 200 pgs / 108 color 129 b&w.